January 13, 2011 - Now ready for departure, Southwest Airlines' Pilots begin Required Navigation Performance (RNP) efficient flight procedures at 11 airports nationwide. This major milestone is to reduce environmental impact with a more efficient operation and to assist the Federal Aviation Administration (FAA) on NextGen initiatives. It is the culmination of a four-year project with partners Boeing, GE, and Honeywell. RNP is satellite-based navigation that brings together the accuracy of GPS (Global Positioning System), the capabilities of advanced aircraft avionics, and new flight procedures. "RNP sets the stage for Southwest to continue doing its part to conserve fuel, improve safety, and reduce carbon emissions and Greenhouse gases, while simultaneously taking advantage of the high-performance characteristics that exist in an airline's fleet," said Captain Jeff Martin, Southwest's Vice President of the Operations Coordination Center. 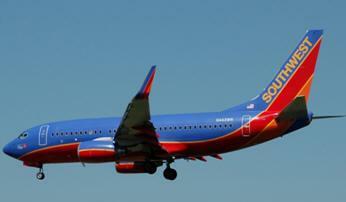 "The efficiencies RNP introduces help Southwest be a good neighbor while also maintaining our low fares." GE Aviation?s flight management system TrueCourse is providing the technology to enable Southwest Airlines? pilots to begin flying Required Navigation Performance (RNP). TrueCourse is standard on all Boeing 737 aircraft. RNP is a satellite-based navigation that brings together the accuracy of GPS, the capabilities of advanced aircraft avionics, and new flight procedures. ?TrueCourse enables operators to fly the most efficient RNP operations available,? said Chris Beaufait, president of Avionics for GE Aviation Systems. ?Southwest is well equipped and is positioning to lead the way in the expansive use of these approved routes realizing fuel, emission and noise reductions.? The TrueCourse flight management system controls the aircraft track to an accuracy of 10 meters (33 feet) and the time of arrival to within 10 seconds to any point in the flight plan. Benefits include the ability to fly shorter flight paths and idle-thrust descents which reduces fuel consumption, thereby lowering emissions and community noise levels. Software and hardware updates provide the latest technology to continue to meet the needs of the world?s evolving airspace requirements, offering safe and efficient improvements to aircraft operations and dispatch reliability. The Southwest Pilots and Dispatchers now follow these new efficient flight procedures and enhanced avionics to fly specifically designed satellite-based navigation approaches to many Southwest airports. The primary airports with efficient RNP procedures include Amarillo, Birmingham, Boise, Corpus Christi*, Los Angeles, Chicago Midway, Oakland, Oklahoma City, West Palm Beach, Raleigh-Durham, and San Jose. With RNP/NextGen procedures designed at 11 Southwest airports, the Southwest's projected savings is $16 million a year, with an anticipated savings of more than $60 million per year once all Southwest airports have efficient RNP procedures. "RNP is a significant step in the future for the NextGen Air Traffic Control system," said Mike Van de Ven, Southwest's Executive Vice President and Chief Operating Officer. "This milestone culminates substantial efforts by our Company working with the FAA to position Southwest as a leading participant in a modernized air traffic control system." In addition to modifying 345 Boeing 737-700s with new flight display software and ensuring that all new aircraft are RNP ready, this cross-company effort involving Technology, Maintenance & Engineering, and the Operations Coordination Center also featured intense training efforts to support achieving this milestone. "I am very proud of our Flight Operations Team for the design, training, and implementation of NextGen procedures, including training more than 5,900 Pilots to fly Primary Flight Display Navigation Display (PFD/ND) procedures," said Captain Chuck Magill, Vice President of Flight Operations. "This extensive training allows us to capture RNP procedures as well as provide flexibility in any new aircraft platform we might use in the future." Southwest Airlines is the nation's largest carrier in terms of originating domestic passengers boarded, now serving 69 cities in 35 states. Southwest Airlines is based in Dallas, operates more than 3,100 flights a day and has nearly 35,000 Employees systemwide.